"...God shows His love for us in that while we were still sinners, Christ died for us" (Rom. 5:8). It is impossible to receive the love of God without an awareness of sin and Christ's death. It's much like the human inability to grasp goodness without the knowledge of evil. God's love can only be understood in light of His wrath, which burns against every man until he is saved from it. God's love cannot be conceived by a human any other way. 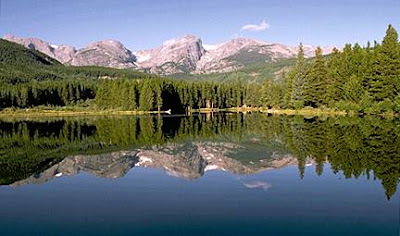 A few mornings ago, a friend of mine was leading worship in beautiful Estes Park for a worship leaders retreat. In roughly six songs, he told the story of our need for God's mercy, His love and beauty culminating in His death on the cross and victory over sin and the grave. After what I believe was the climax of the story, Christ's crushing of our sins, my friend sang a simple cathartic refrain that fit so perfectly in the narrative I could have cried. He quietly began singing, "I could sing of Your love forever, I could sing of Your love forever." This little chorus meant so much to me and was entirely necessary, especially considering the theme of the previous morning's song and devotional session: Receiving God's Love. According to the speaker that day, God doesn't love us based on how much we can do for him. He went on about the Father's love and other truths I needed to hear, but what I really needed to hear, in order to truly receive God's love, he never said. I was longing to hear the story of my sinfulness and Christ's sacrifice for me, namely, how God demonstrated His love for me. I was needing to be reminded of the gospel. It was simply skipped. Some might say that we can sing and speak about God's love without any mention of the cross, because it is a given. We already know what He did for us, so it is not imperative that we intentionally and verbally acknowledge it every time we gather. I, however, would strongly disagree. Why? Because I am a human, who constantly forgets the gospel. One day, a couple of Martin Luther's parishioners approached him after Mass, and asked, "Pastor Martin, why do you keep preaching the same message? Don't you think we know the gospel by now? Why do you tell us the same thing week after week?" Luther replied, "Because week after week you forget it." So, when my friend, the following morning, told that beautiful story of how God demonstrated His love for us, then sang that simple, way-over-used chorus, "I could sing of Your love forever," it hit home more than ever before. I was reminded of my great sin and God's even greater mercy, and I received God's love for me to start the day, His new-morning mercy. I need to be reminded every day of how God demonstrated his love for me. It is only then that I can most fully receive it. We have just completed a template for our church's new order of worship. It, however, is not anything new and innovative. Christians have been using the four-part structure of worship since nearly the beginning of the Church. The flow of the service is as follows: Gathering, Word, Table, Dismissal. Go to any liturgical church, and this is what you'll find. Now, our church is quite far from practicing in the traditions of the high church, but we are finding great value and effectiveness reaching back to the principles of some ancient practices. For one, we have decided that as humans who constantly forget the gospel we need to be reminded of Christ's life, death, and resurrection every time we gather. So, instead of taking Communion once a month, we will partake of the Lord's Supper weekly. And not only will we receive the elements weekly, we will actively come to the Table rather than remain in our seats as the elements are passed. For another, we have moved the bulk of our music to the Table portion of the service. This way we have already received the Word and Communion and have a whole lot more to respond to in musical worship. We follow the historic four-part structure of worship: Gathering, Word, Table, Dismissal. Offering - This is an opportunity for us to give back to God for the work of His Kingdom. Offering boxes are located in the lobby and at each auditorium entrance. Fellowship - Here we have a couple minutes to say hello to each other and get caught up on what’s happening in our community. Communion - Everyone who is a follower of Christ is invited to come to the Lord’s Table, where together we remember His life, death, and resurrection. Praise Songs - Music is one way for us to respond in worship to God’s Word and Communion. We lift our voices to Him as an expression of our love and gratitude for who He is and what He’s done. Blessing - Our worship doesn’t end in this building. We go in the name of the Father, Son, and Holy Spirit to impact the world as we follow Jesus together. Ministry Prayer - We have ministry teams available at the front to pray with anyone who has a need or concern. We have all heard the cliché, “Worship is a lifestyle,” but I would argue that in our culture, and perhaps most cultures past and present, it is almost impossible to have a lifestyle of worshiping God. There are so many other gods competing for our time, screaming for our attention and worship—ascribing worth to something, or saying to something, “You are worthy of my time and affection.” In our culture, “I” am the center of the universe. More important than anything else in the world is that I please myself, others please me, and that I fill my life with things that make me happy. What this amounts to is a view that God is merely an “object” of my affection, along with many other objects. I fit God into my “very important” life, saying, “Here you go God. Here’s where you fit into my life. You can have Sunday mornings and an occasional shout-out when trouble comes my way during the week.” In this view, I am the subject, the source, the beginning point, and God is the object of my affection, somewhere far-off, sitting on a throne, begging me to worship Him and not other things. This is a backwards perspective. If we are ever going to truly believe that worship is a lifestyle, we must first hold to the fundamental understanding that God is the great subject of the universe and we are objects of His affection. God is, in the words of Bob Webber, the Cosmic Narrator, and we are to find our place in His story. We don’t fit God into our lives, but rather, God fits us into His. This is a revolutionary thought for me. And although I constantly lose perspective, when I am reminded of the astounding truth that God is the subject and I am the object, it is that much more enjoyable and normal for me to live a life of God-worship. I wonder if this subject/object reversal would help others in their daily worship of God.